Rock Climb | THERMO Spoken Here! A rock climber (50 kilograms) climbs down from the summit of a popular beginner-level formation (the competition is timed, "up and back.") The summit elevation is "H" meters greater than its bottom. ii) Calculate the work of the climber. The superscript identifies the space of the event as an 0XZ-plane. The summation of forces (right-of-equality) reminds us to add All forces relevant to the event. Usually there is more than one force. The sketch at the right representing the man (approximated as a BODY) is exaggerated in size to permit the forces to be shown. Newton postulated two classes of force. Those that act upon the body "at a distance" (which we call "BODY forces") and others that act directly upon the BODY, (which we call "surface forces). We rewrite the sum of forces of equation (2) as a single force of gravity (acting downward, labeled "force of gravity") and the sum of all other forces of contact with surroundings (assumed acting upward) which we label as "Surface Forces." The sketch depicts the man at some "arbitrary location" during his climb. The actual climb occurs quite slowly and the longer it takes the smaller is the term left-of-equality in Equation (2). Mathematical expressions for Newton's 2nd Law and a displacement are written below. The term left-of-equality is the differential of a scalar property of the system (the man). This property (the first of energy related properties) is called kinetic energy, with the symbol KE. The steps above illustrate how differential mathematics is used to characterize physical change "at its basis." At its basis is the differential limit of no change at all. Reality involves change. Differential mathematics portrays reality when the differential equation is integrated between its limits. We apply the integration operator with limits to Equation (4e). Our next step is to write Equation (3) with the forces expressed in magnitude-direction form (below left). 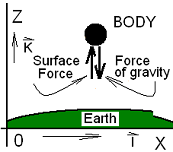 The gravity force has magnitude, mg, and its direction is downward, in the "-K" direction. The magnitude of the "force of support" is |F|, its direction id "K." Also written (below right) is a differential vector displacement of the climb. Let's discuss this equation momentarily. Each term right-of-equality represents differential work, each term implies the potential of a force acting through its differential displacement consequent with an event of the BODY. The first term right-of-equality is known. It has a magnitude, "mass times gravity" and the direction of that force is downward, toward Earth. The unit vector, "minus K," quantifies the direction. The second differential of work is non-zero. That work occurs with the surroundings. With a "climbing event" of finite displacement, upon integration ,that is, the differential terms of Equation (5) become finite. Simple limits of integration for an event are: z = z1 to z1 + H.